MBC needs your business to participate. You are the key to #ShopMedway’s success! More offers from more businesses means more value for everyone. Participating is simple…just come up with an offer and submit it. MBC will take it from there. If you’ve heard about #ShopMedway but haven’t yet submitted an offer. Take 15 minutes now to think about what you can offer and then contact us to get it online and start promoting your business. Make it the one thing you do today to help create awareness and potential new business for your company. MBC’s #ShopMedway Initiative is a FREE member benefit to help you promote and build your business! If you’re like most businesses, you probaably are solicited for lots of advertisting opportunities…newpaper ads, program books, facebook ads, flyers, etc. If you look at your annual MBC membership cost of $95 a year, participating in MBC and #ShopMedway is a HUGE BARGAIN. Where can you promote your business for just $8.00 a month? Probably no where! Plus you get all the other benefits of membership of networking, events, print ad listings, website list. We just posted clear INSTRUCTIONS ON HOW TO PARTICIPATE…please take a moment to read it now at https://medwaybusinesscouncil.org/shopmedway! 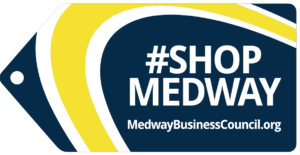 Having great offers from many businesses on #ShopMedway will encourage Medway Consumers to visit often and help us create a buzz around town about what MBC is doing. We want Medway residents and businesses to know how important it is to patronize local businesses. Also, the more successful #ShopMedway is, the more it will encourage other business owners in town to join MBC and become part of our effort. THERE IS POWER IN NUMBERS! If we can get more businesses promoting each other by promoting #ShopMedway, we all win. Again all of this is FREE for being a member, you just have to come up with an offer. Perhaps you already have another offer that you’re promoting elsewhere…so you really don’t have to come up with anything new….just take advantage of a free way to get the word out. Also….please tell other business owners you know about #ShopMedway and MBC. Even if they don’t have time to come to meetings, they can benefit by getting their name out there through #ShopMedway. Again…at $95 a year…less than $8.00 a month it’s a tremendous bargain to promote their business and network with other businesses. Still have questions….contact Julie Dennehy or Tina Chemini for more details.